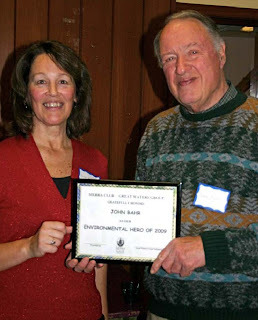 John has worked diligently for the past five years on the issue of global warming and energy conservation. He has raised awareness of this important problem through talks to anyone who will listen and through meetings with civic and business leaders. He has targeted his home community of Wauwatosa, helping it develop practical ways to reduce its energy use. He now sits on a Wauwatosa committee that is developing a strategy to make the entire community a “Cool City.” Congratulations, John. The Great Waters Group stands behind you in all your efforts.